The hottest social media star in the Middle East is a radical Saudi cleric. But this powerful figure has gone virtually unnoticed in Western media. Do we need a new “Manhattan Project” to counter social media’s power to promote terror and extremism? Western observers marveled at the power of social media to mobilize young protesters during the Middle East’s “Arab Spring”. When democracy didn’t result, many Americans lost interest. Meanwhile social media became a prime recruiting and organizational tool for terrorists and extremists in the Middle East. What can we learn about the power of social media to persuade that might apply to situations in America? Dr. Haroon Ullah is currently the Chief Strategy Officer at Broadcasting Board of Governors (BBG) where he oversees the Office of Policy and Research (OPR) and the Office of Internet Freedom (OIF). 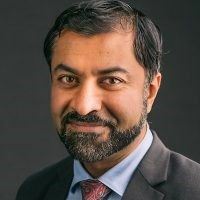 Formerly from the U.S. Department of State, Dr. Ullah most recently worked on Secretary Tillerson’s Policy Planning Staff, covering digital innovation, public diplomacy, and public/private partnerships. He previously advised three Secretaries of State and traveled with Ambassador Richard Holbrooke’s Afghanistan/Pakistan team. Dr. Ullah is a visiting professor at Georgetown University and a Term Member of the Council on Foreign Relations. He holds an M.A. from Harvard’s Kennedy School of Government and a joint Ph.D. from Harvard and the University of Michigan. He was a William J. Fulbright Fellow, a Harvard University Presidential Scholar, and a Woodrow Wilson Public Service Fellow.